Looking for a unique, colorful gift for your next birthday or event you are hosting? These handmade decorative candles by Atlanta-based etsy shop, When it Rains, are just too cute to pass up! 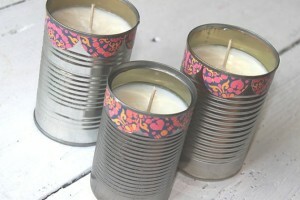 Handmade soy candles are poured into recycled jars and cans and then adorned with ribbon, twine, and colorful papers. I love the idea of giving this honeysuckle set in recycled cans for a birthday or housewarming gift- just pick the paper pattern that will match your recipients decor for a custom gift that is full of love. 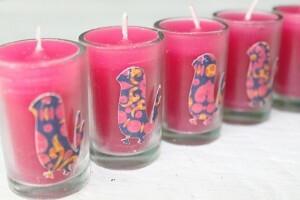 Or for an event that you are hosting, like a bridal or baby shower, how cute would it be to line up a set of these colorful baby bird votives for a parting favor for your guests? They would be adorable lined up on a shelf or mantle as p art of your party decor and could simply be passed out as guests begin to leave. Check out the shop, When it Rains, for more adorable candles and other goods. This Atlanta artist also specializes in paper goods, event decorations, office accessories, and luggage tags- so you are sure to find a perfect gift for anyone you have in mind! Precious! What a great idea for a hostess gift or a favor for a wedding, shower or a party! I’m thrilled that something I created caught someone else’s eye. Thank you for writing such a fab review on my Etsy shop!